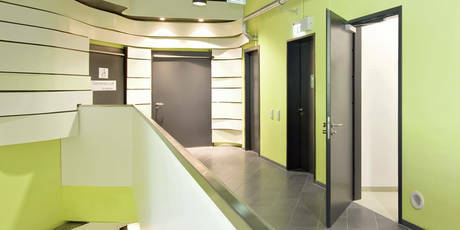 All the new Teckentrup fire protection doors are tested in accordance with EN 1634-1 (DIN 4102). During the test, a temperature difference of 180 K (corresponds to approx. 200°C) should not be exceeded at the individual measuring devices on the surface facing away from the fire at a furnace temperature of approx. 1000°C. The space-enclosing effect is additionally monitored. According to the number of minutes it takes to exceed the test criteria, doors are classified as T30, T60 or T90.